On the cusp of graduation, more than 2,500 of ASU’s College of Liberal Arts and Sciences students are poised as adaptable critical thinkers, entrepreneurs and leaders destined to shift the course of communities and nations. Michael McDowell, an ASU graduate with a bachelor’s degree in biochemistry from the School of Life Sciences, is very active in undergraduate research projects, and accepted the President’s challenge. McDowell, currently in his final year of medical school at Columbia University College of Physicians and Surgeons, has already been published 13 times and co-authored 5 textbook chapters. In addition, he has received $600,000 in grants toward his research on pediatric cerebrovascular surgery – research he became passionate about as an undergraduate participating in the School of Life Sciences Undergraduate Research program. Once his final year is finished, McDowell will begin his residency at the University of Pittsburgh. 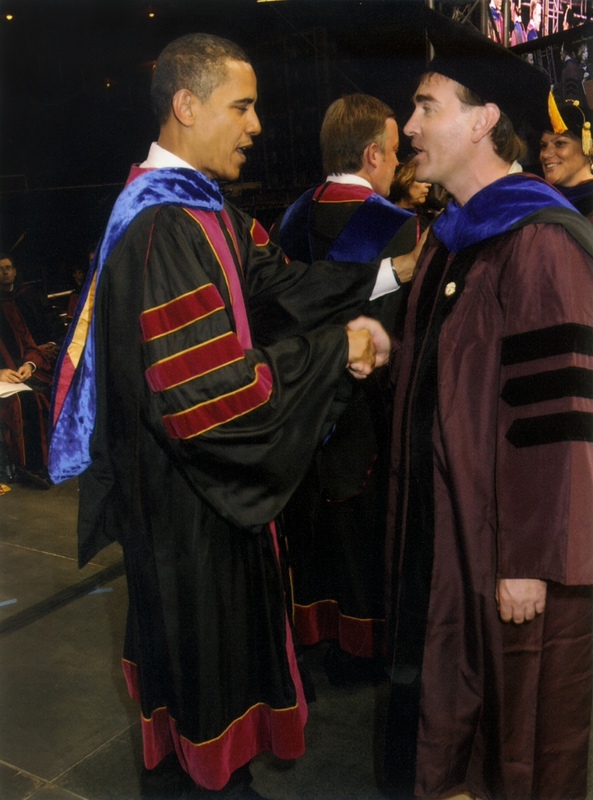 While McDowell was already well on his way to success before the President’s speech, he did have an experience few others did – he shook President Obama’s hand during commencement and exchanged a few words. McDowell is not the only 2009 ASU graduate to see success. Others, including biological sciences graduate Rachel Lusk, are making a difference throughout the world. Her undergraduate degree at ASU focused on biology and society. Lusk has already graduated from medical school and is currently in the middle of her residency at Phoenix Children’s Hospital. Also impressive is the outreach work she has completed in rural locations, including the Navajo Nation and Malawi, Africa. Lusk said she always wanted to work in rural communities, and she hopes to continue doing so wherever possible after her residency is finished. In addition to hearing the President’s inspiring words, Lusk said she is grateful for all the exciting opportunities she had at ASU. Shaan Akhtar is also a 2009 graduate who earned a bachelor’s degree in biological sciences with a concentration in biology and society from the School of Life Sciences. For Akhtar, the most important thing about his post-graduate career has been integrating his commitment to service with his interest in science. Since age 15, he spent his summers volunteering with the Ocean Discovery Institute, an organization that uses marine science to engage urban youth in conservation activities. Experiences like those have guided his decision to attend medical school at the University of Arizona College of Medicine-Phoenix. Now in his third year, Akhtar has started his clinical rotations and said he finds it very exciting, but humbling. In addition to the typical duties of a medical student, Akhtar participates in research studies with the Muhammad Ali Parkinson Center at Barrow Neurological Institute. Akhtar said he appreciates the education and experiences that the School of Life Sciences and ASU offered that prepared him to apply what he learned in class to a changing society. His 32-year music career included working as a studio musician, record producer and tour manager for such noted names as Chuck Berry – with whom he went to Japan, Russia and Europe – Bo Diddley, Ben E. King, Lesly Gore and The Turtles. “I had a great time. I loved doing it,” he said. Since graduation in 2009, Cioffi has collaborated with ASU Department of English professor T. R. Hummer, a poet and musician, on the AmeriCamera project. The two co-wrote an album in 2010 that they describe as a blend of music, poetry, photography and video (High Minded. The AmeriCamera Project. Electric Lotus Music, 2010). AmeriCamera was also featured on the Emmy-nominated Songwriters’ Showcase series, produced by the City of Tempe and aired on KAET PBS 8. Cioffi is musical director for the series. Ruddell is an assistant professor and director of undergraduate studies at the Spatial Sciences Institute at the University of Southern California. Ruddell teaches and develops curricula in GeoDesign and advanced online programs in Geographic Information Science and Technology. GeoDesign is a forward-thinking, interdisciplinary framework that pairs planning, design and environmental systems with geospatial technologies to explore ways to build a better world. Chris Samila – BA, global studies (certificate: sustainability and urban systems); BA, political science (certificate: international studies). Samila is now partnerships manager with Optimizely, a San Francisco-based global market leader in digital content optimization. This group empowers marketing professionals to rapidly test and personalize digital content (images, text, designs) to improve conversions. At ASU, Samila founded the School of Global Studies Student Association and the company GreenSummit, Inc. In 2008, the summit attracted 4,000 attendees to the Phoenix Convention Center, where President Crow gave the opening address. Scott Bates – MA, PhD, plant biology. Bates is now an assistant professor and curator with the Bell Museum of Natural History with the University of Minnesota. While at ASU, Bates managed the Lichen Herbarium exchange program and served as a specialist for the USDA’s Forest Inventory and Analysis Program. He pursues studies in fungal diversity and soil-borne fungal pathogens, and is part of National Science Foundation’s Advancing Digitization of Biological Collections program. Andrew Gamalski – BS, physics; BS, math. Gamalski’s research studies began at the age of 15. He developed an algorithm using linear programming to minimize factory inefficiency as part of the high school research program of ASU’s Southwest Center for Education and the Natural Environment. By the time he entered ASU as a freshman, he’d completed enough college coursework to be designated a junior. Called a “force of nature” by faculty, the College of Liberal Arts and Sciences offered the perfect proving ground for his skills in mathematics, chemistry and physics. He received a Marshall Award, which took him to England to study for two years. He completed his PhD in Electrical Engineering at the University of Cambridge and now conducts research in nanowires with Intel Corporation. ASU's Cronkite class of 2009 has blazed new career paths, succeeding at new jobs and opportunities – some that did not even exist before the recession. The class of 2009 from Arizona State University's Walter Cronkite School of Journalism and Mass Communication has blazed new career paths, succeeding at new jobs and opportunities – some that did not even exist before the recession. Samuel Burke has made a name for himself in the burgeoning field of Spanish language broadcast journalism. 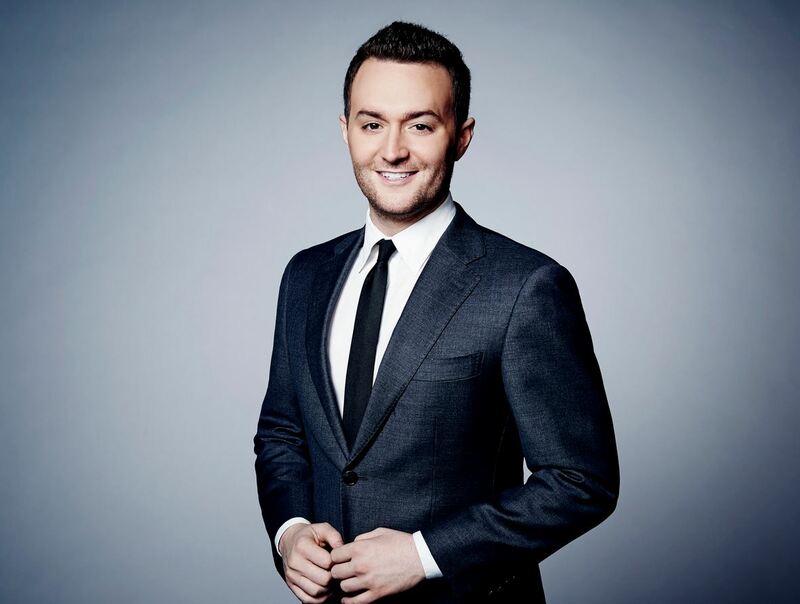 He is a technology correspondent at CNN and also anchors technology news programs at CNN en Español. He reports on how technology and social media affect the business world and consumers. Burke has constantly had to adapt in the news world, moving nearly a dozen times, living in London, New York and Atlanta, acquiring different technology skill sets to succeed in his career. He said the Cronkite School and ASU gave him the training and technical skills needed to make sound, ethical decisions in the 24-hour news environment. Cronkite School graduate Amanda Chan found a career in health journalism as a senior editor for Health News at The Huffington Post, which was a nascent online publication in 2009. Chan’s path to The Huffington Post started because of a staff writer position with another online publication, MyHealthNewsDaily.com. Along the way, she became skilled at social media, which she said is very important for consuming and sharing news online. Chan said her ASU education gave her the skills and experience needed to excel at her job. Jonathan J. Cooper, Associated Press statehouse reporter in Salem, Ore.
Jonathan J. Cooper launched his career at The Associated Press through immersive professional experiences offered at the Cronkite School at ASU. In the past five years, Cooper has risen through the ranks to become an AP statehouse reporter, where he covers government and politics in Oregon. Since 2009, Cooper’s responsibilities as a reporter have evolved with the rise of social media and mobile devices. When he started, he primarily wrote print-style articles. Today, he develops stories for a variety of mediums, including the AP mobile news app. Cooper said his ASU education provided him with the journalism skills necessary for success. Ashley Panter started at a public relations agency when she graduated from the Cronkite School in 2009. Her job quickly transformed from traditional public relations to online media management, focusing on websites and search engine optimization. Panter took those skills with her to the Desert Botanical Garden in Phoenix where she manages an e-commerce website with more than 200 pages, as well as email marketing and numerous social media channels. She said her ASU master’s degree has helped her adapt to today’s changing job market.